The Indianapolis Colts have announced that running back Christine Michael has been placed on IR. Michael went down with an undisclosed injury at OTAs on Wednesday, and the Colts have signed Troymaine Pope in a corresponding roster move. Michael was recently signed by the Colts as a free agent after spending time with the Seattle Seahawks, Dallas Cowboys, and Green Bay Packers. In his career, Michael has amassed 1,080 yards from 254 attempts and tallied seven touchdowns, with an average of 4.3 yards per carry. He has earned overall season grades 69.7, 64.0, 71.4, and 65.8. The latter ranked 49th among running backs in the NFL in 2016. He re-signed with the Seahawks in 2016 after a disappointing spell in Dallas, and started seven of nine games before his release. 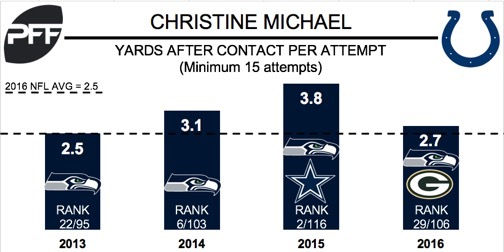 He led the Seahawks in attempts, yards, and yards after contact per attempt. He earned a pass-blocking efficiency rating of 95.0, the seventh-highest mark among all backs with at least 35 pass-blocking snaps during that time. He was signed by the Packers from Week 12 to the Conference Championship, and earned an elusive rating of 68.4, the eighth-best mark in that period of time. He was released in the offseason. Michael finished the 2016 season with an elusive rating of 50.8, which ranked 14th among 53 backs with at least 80 attempts. His average of 2.68 yards after contact per attempt ranked 21st.